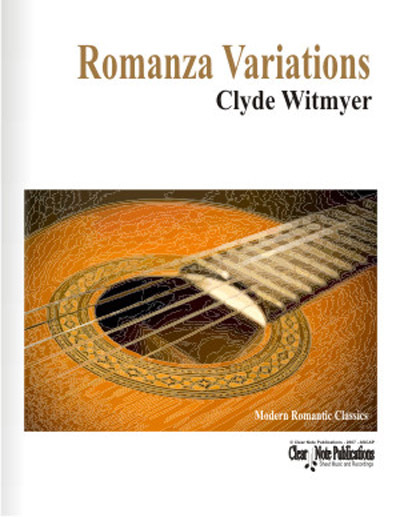 "The Romanza Variations represent a departure from my usual compositional style best described as an outgrowth of the “Second Viennese School.” On the contrary, these variations blend aspects of traditional melody, harmony, rhythm, and form with elements of modernity. Composed in January 2003, the theme was inspired by the famous work for the guitar, Romanza (Anonymous, 19th Century) and its hauntingly, doleful minor key sentimentality. Employing the same key (E minor) and texture as the Romanza, I constructed a simple theme emphasizing the neighbor relationship between Le and Sol. In a sense, the theme is a vehicle for this half step relationship, which subsequently, generates much of the content expressed throughout the variations."